And now we step into the darker side of the wheel. Into the days of roots and stones and antlers and bones. A time to shed what we no longer need to carry, and to squirrel away what will carry us through the cold months ahead. Samhain, Hallowe’en, Witches New Year…there are many names for this liminal time. For these in-between days when the veils are thinnest. We are now exactly half-way between the Fall Equinox and the Winter Solstice. This is a potent time of magic and transformation. A time that asks us to send our energy downward. Into our roots. Into the Underworld. Homemade wreaths and swags have long been prescribed by folklore as talismans to protect the thresholds our homes. 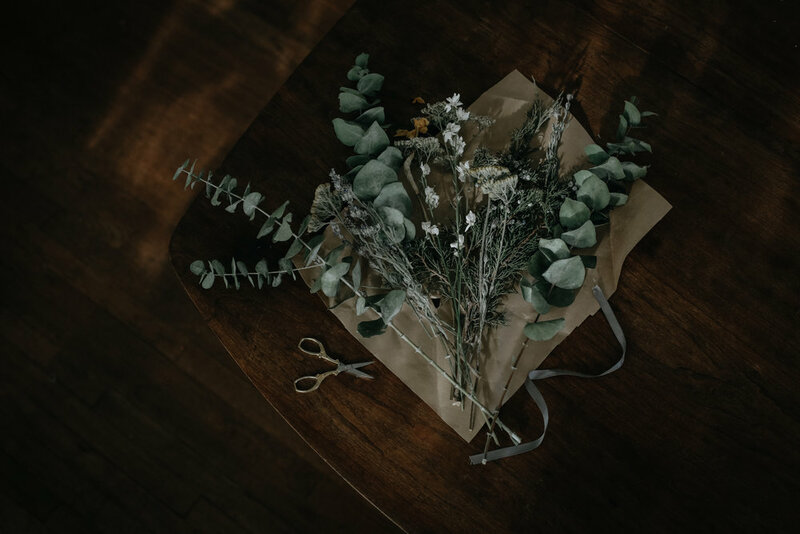 This simple wreath is a lovely way to enchant your space with protection and abundance for the darker days ahead, and to quietly honor the natural cycles of life and death. 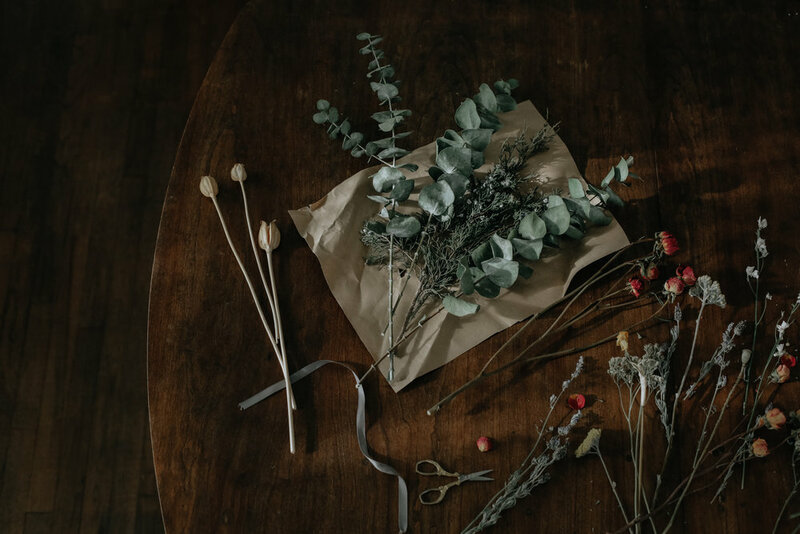 I spent a few minutes wandering through the garden, clipping hearty herbs that had managed to escape the morning frosts, and departed flowers that had dried on their stalks. I used whatever called out to me. Rosemary for remembrance and protection. Lavender for a restful hibernation. Yarrow to shield against melancholy. Eucalyptus to remove negativity. Black feathers because they just kept appearing in my path. I highly recommend wandering through your own yard or neighborhood and taking small clippings of whatever catches your eye. Let your intuition guide you. Don’t worry if they are dead or faded, they will look beautiful. I also had a few pomegranates rolling around our kitchen fruit bowl, which I included to honor Persephone’s decent into the Underworld. This quiet ritual takes just a few minutes and is best performed with a steaming pot of tea and a few glowing candles. There are no rules or complicated steps. No incantations to recite. Just plants and herbs and a few moments of quiet intention. Wishing you all a magical, mystical Samhain, dear ones. Once you have gathered your clippings, start by playing around with the overall layout for your design. At this point you can just loosely stick them into your wreath base (not securing them yet) so you can easily experiment with what looks good where. Trim the clippings to size if needed, leaving enough stem to secure them to the base later. I find it’s easiest to start with the larger elements, and then weave in the smaller clippings to fill in the gaps. Like I said, there are no rules here. Just play with combining colors and textures until it starts to feel right. As you are working, see if you can tap into the energy of each plant. Notice the beauty of weaving together the natural cycles of life and death. Once you have settled on the placement of your clippings, begin securing with wire as needed. With this particular style of wreath, I was able to secure most of the stems simply by pushing them firmly into the base as far as they would go. During this stage, I like to visualize the intentions and feelings I am calling in and weave them into my wreath. If you are calling in protection and abundance, for example, visualize yourself in your cozy home, safe from the wind and rain, with a cup of tea and everything you need. If you are attaching larger fruit like pomegranates or apples, insert the sharp side of the kabob dowel firmly into the bottom of the fruit. This gives the fruit a nice long stem to securely stick into the base of your wreath. Watch out for the few drops of pomegranate juice that may escape…they stain big time. 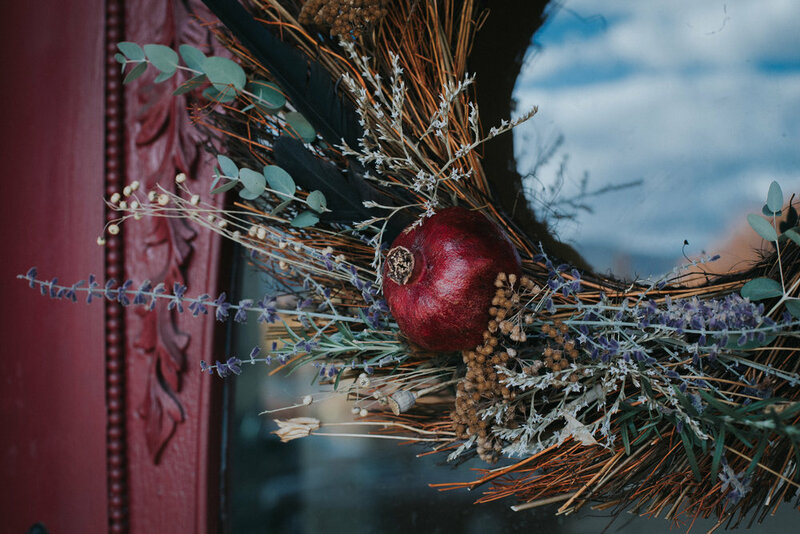 Stick the doweled fruit into the base of your wreath. Cut about an arms length of wire and begin wrapping it around the dowel and the wreath base to secure it. As you are working, hold your wreath up from the top center point (where it will hang) every few minutes to make sure the weight and balance are evenly distributed. You may find as you do this that certain elements need to be additionally secured or moved to keep from falling out. I found that 2 pomegranites was simply too heavy and ended up removing one. Perhaps you use these moments to reflect on the balance in your own life. Does anything need to be adjusted or redistributed? Once everything is safely secured, you are ready to hang your wreath. I like to visualize a shield of protection as I hang the wreath on my front door. Maybe ring a bell or blow out your candle to complete the ritual. Whatever feels right. I have always been fascinated by the Victorian language of flowers. 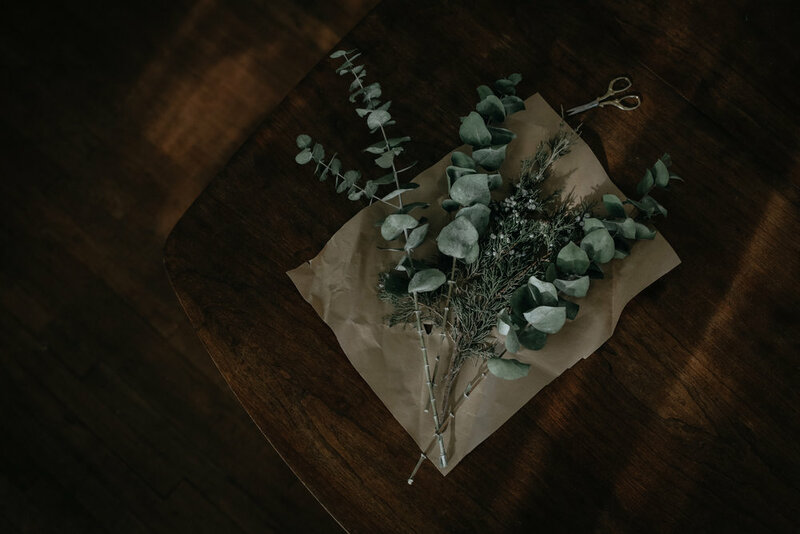 By the idea that a bundle of fragrant Narcissus left surreptitiously on a doorstep meant unrequited love, while a single sprig of Oleander was a clear warning that the recipient should be very cautious. Acacias were for friendship, Melianthus for secrets, Hyacinths to beg forgiveness. Red Roses only if you were really serious about someone. 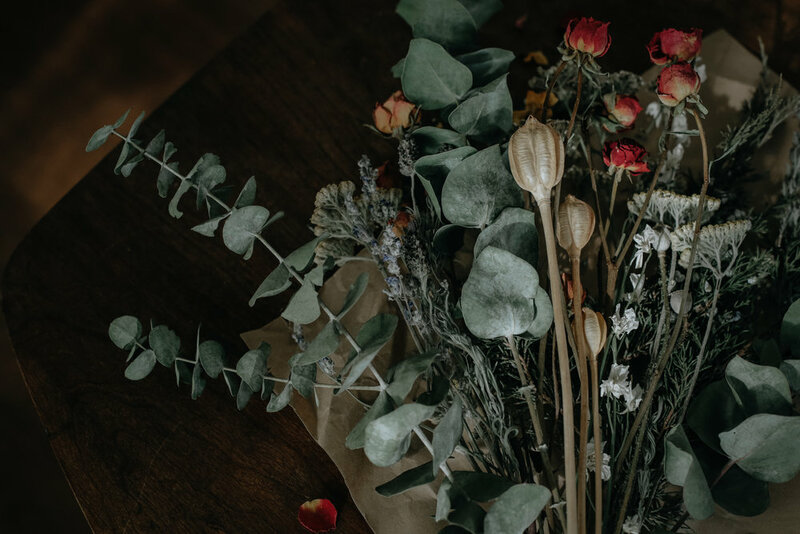 So for this year for Valentines, I teamed up with the wonderful Melissa Emily of Earth Within Flowers to create a conscious and intentional love token. Melissa sources all of her flowers from local farmers in the summer months, then dries them by hand for winter bouquets. What a lovely and earth-friendly alternative to the standard cellophane wrapped blooms we so often see piled into supermarkets this time of year. 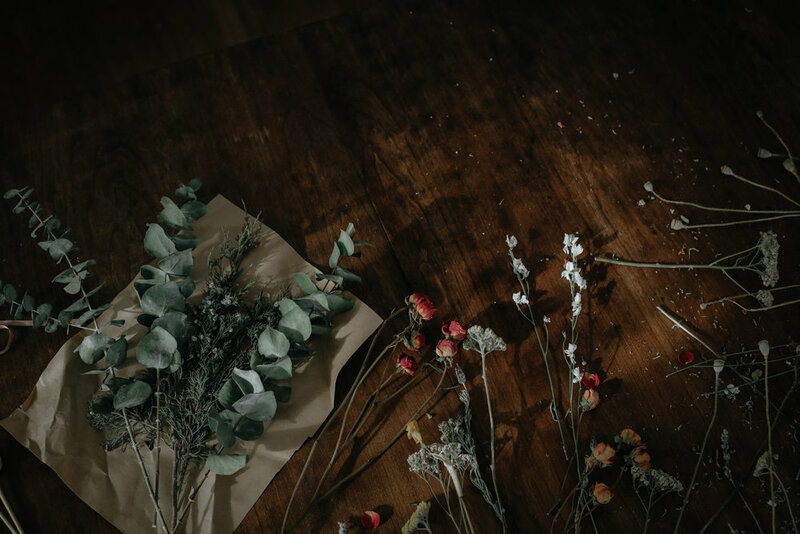 Please note that even though we used dried blooms, you could easily create a similar arrangement with live flowers if that's more your speed. Just look up the traditional meaning and symbolism behind each stem to create your own secret love spell. Step 1 :: Start by creating a horizontal, rounded shape with branching foliage. Here we used eucalyptus and locally foraged juniper, which are both believed to provide protection. Step 2 :: Next, add in your filler flowers. Anything that has sprays of multiple buds on the same stem works beautifully for this. Try to fill in the gaps between your foliage. We incorporated local yarrow for courage, lavender for serenity + devotion, and white larkspur for lightness + laughter. Step 3 :: Next, pop in your focal flowers. We chose these sweet little peach and pink spray roses for love + desire. Step 4 :: The final step is to add in your "sparkle" flowers. These are pointed or uniquely shaped blooms that add interest and texture to your piece. Here we chose tulip pods, traditionally associated with declarations of love, and poppy pods for magical dreams. And that's it, dear ones! 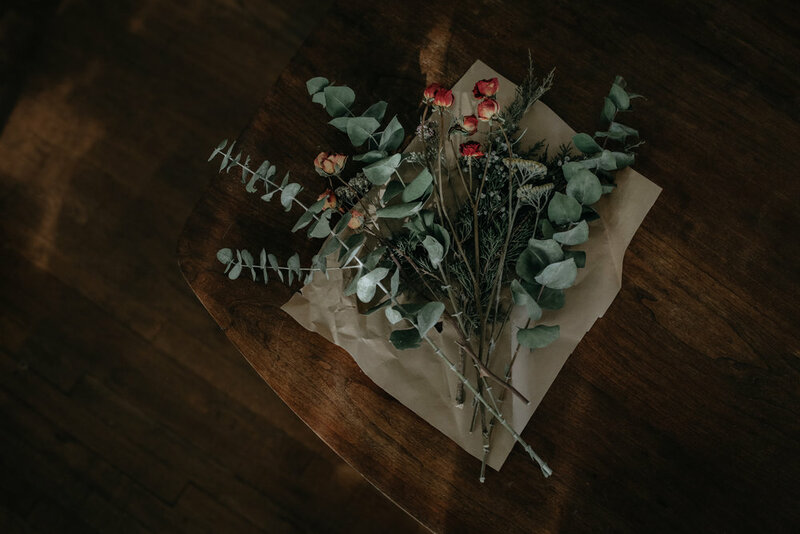 All that's left is to bundle up your floral love spell with a simple ribbon and handwritten note with the symbolism of each bloom. So much love and gratitude to Melissa of Earth Within Flowers for sharing her magic with us. Be sure to visit earthwithin.com to order something lovely and learn more about her eco-friendly-flower mission. Wishing you all my love today and every day. What is it about darkness that can make us so uneasy? Perhaps it's the thought of what might be lurking in the shadows. Or an instinctive impulse not to stray too far from the safety of the fire. Maybe it's simply a deeply-rooted, deeply-human fear of the unknown. Of that which we cannot see. But there is great healing to be found in the dark, if we are willing to step into it. If we allow our eyes to adjust and our senses to heighten. It's where we dream, after all. And incubate. And rest. And look towards the stars. It's a place of deep transformation and magic. The Winter Solstice marks the darkest point in the year for those of us in the Northern Hemisphere. A time that asks us to send our energy downward. Underground. Into our roots. To tap into the wealth of nutrients and healing that lay beneath the surface. This beautiful ritual was created and shared with me by the lovely Bridget Ambrose of becrowbe. Bridget is an Intuitive Reiki Master, Integrated CranioSacral Practitioner, Energy Medicine Healer and all around modern mystic. What I love about her ceremony is that it is practiced the entire month of December. A wonderful way to stay conscious and mindful during the holiday season. To clear out any residual negativity and make space for the abundance of the new year. To honor the darkness, and welcome back the light. The only thing you really need for this ritual is five large white candles. Everything else is totally optional. 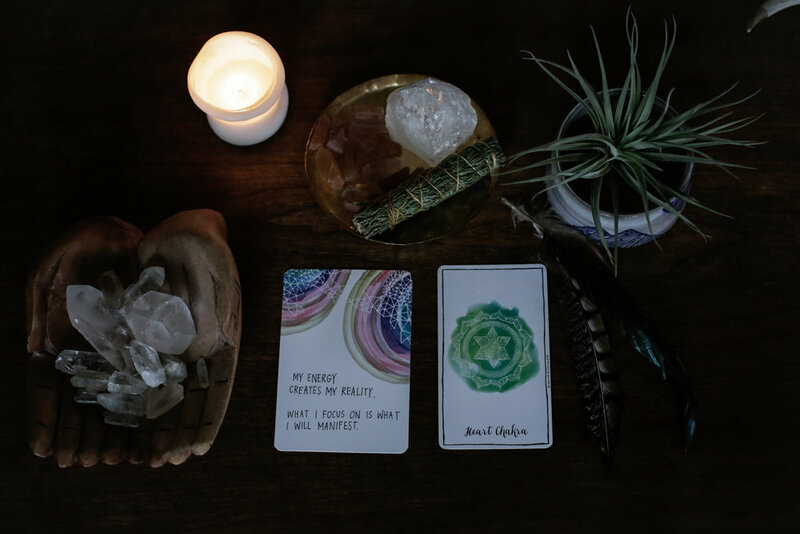 Bridget and I have put together a list of suggested stones, scents, and rituals to work with each week, but also encourage you to follow your intuition. Your ceremonies can be as simple or elaborate as you wish. You do you, loves. Each week, we invite you to light the candle for that week, as well as all the candles from the previous weeks. Sit in quiet meditation for a few minutes with the associated mantra. Maybe do some gentle journaling, or pull a card if you feel called to. Make a special cup of herbal tea. Practice self-care. Whatever feels good to you and your body. By the Winter Solstice on December 21, you will have all five candles burning. Continue to light all the candles every night, from Solstice through New Years Eve. December 1 - 7. This first week you will actually light two candles, one to release that which is no longer serving you, and another to call in love and healing. You can choose to light both these candles on the same day, or to separate them into different ceremonies. This is a lovely way to ground and cleanse your space as you initiate the Solstice Ritual. Focus on clearing any negative energy you no longer want in your life. If you feel you need a fresh start or want to clear the air of any heaviness, start the process by burning this candle. Visualize it burning and composting that which is no longer serving you. I sometimes like to sweep the house or work with cleansing herbs. For the second candle, focus on opening your heart to give and receive love. This candle surrounds you with the essence of love and harmony. It can also be used to create passion or love possibilities and allow self-love to flow freely. This can also be used as a energetic candle, choosing to light it for a period of time when a love energy in your space is desired. Altar Suggestions: Red or pink, rose quartz, rose oil, rose petals, ylang ylang to elevate the affectionate energy. Sage, cedar, celenite to cleanse. 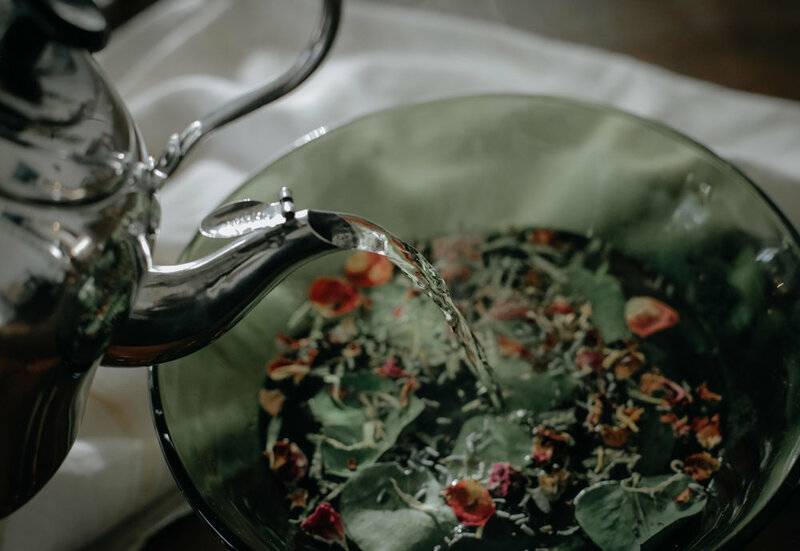 Ritual Suggestion: Call in cleansing energy and loving self care with a candlelit herbal bath or shower. 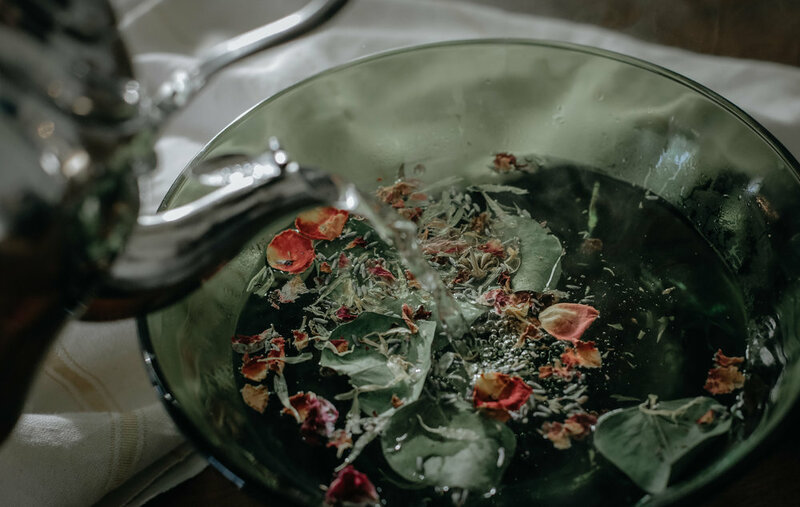 We recommend sprinkling in epsom salts, lavendar or sage for cleansing, and rose petals for love. Turn off all the lights and bathe by candlelight. Pour yourself a glass of lemon water. Let the healing water melt away any negativity or tension you may be holding on to. December 8 - 14. This week you will light the third candle, as well as the first two which were lit last week. Focus on unlocking a creative flow and accessing a confident source of inspiration from the Universe. Imagine it flowing into your being effortlessly. Use this candle to stimulate an artistic venture and create a visionary perspective. Altar Suggestions: Orange, orange calcite crystals, oranges, bergamot essential oil, art supplies, or images that inspire you. Ritual Suggestion: The second chakra responds to all of your wild, wonderful and difficult emotions. Its real essence is creativity or change. The moment we think of something different to do, we are creating. If you always walk or drive the same route to work, purposefully pick another route. Even playing music or dancing stimulates the creative center. You can dial up the creative energy in your space by creating these simple Dried Orange Garlands or Cloved Pomanders. The scent of oranges is also believed to inspire happiness and positivity. December 15 - 21. This week you will light the fourth candle, as well as the three previous. Focus on manifesting success and good fortune into your life and creating a world of unlimited possibilities. Envision an endless river of abundance and prosperity flowing towards you. This is the perfect candle to burn to attract a new opportunity in your life or accelerate your desires. Altar Suggestions: Green, patchouli, jade, citrine, green aventurine, incense, cash or coins, healthy plants. Ritual Suggestion: Abundance Journaling :: Pour yourself a special drink and find a quiet place to journal. Light some candles. Get cozy. Practice feeling grateful for the places you have already been, and for the circumstances that brought you to where you are in life. It’s never too late to realize your dreams. Now is the perfect time to begin. Commit to the adventure of you. Imagine what you want and feel that you have it. Appreciate your life as if everything you want has already happened. It doesn't matter what it looks like. Fall in love with the feeling, not the how. Find even small things about yourself and others to appreciate. Maybe you can appreciate the way your morning coffee smells, or the warmth of a coat or the way a person holds a child’s hand. Begin jotting these down in your journal. I’m a happy, healthy person and I will always be successful. I am wealthy beyond measure. My life is transforming in important ways. True happiness lives in my life now. I now allow the universe to send its unlimited treasures my way. December 21 (Winter Solstice) - 31. This week you will light all five candles. Reinforce your spiritual connection with a white light of purification and peace. Use this candle to express love and gratitude toward the Universe. This can also be used as a energetic candle, choosing to light it only for a period of time when a spiritual connection in your space is desired, perfect for meditation. Altar Suggestions: White, quartz, amethyst, frankincense, feathers, antlers, cedar, representations of light + dark, cranberries, evergreens, elements from previous weeks altars. Ritual Suggestion: Gather with dear ones around a fire (or just the five solstice candles.) Make a special hot cocoa for kiddos or this lovely golden turmeric milk for adults. On a small slip of paper, have everyone write down one thing they would like to release for the coming year. Safely burn the slips of paper in the fire, releasing them to the dark. Keep lighting the candles every night from Solstice through New Years to close the ritual. So much love and gratitude to Bridget Ambrose for sharing her magic. To schedule a healing session with Bridget, (which I highly, highly recommend) please reach out to healing@becrowbe.com. You can also follow her everyday sacredness on ig @themysticbecrowbe and @becrowbe. 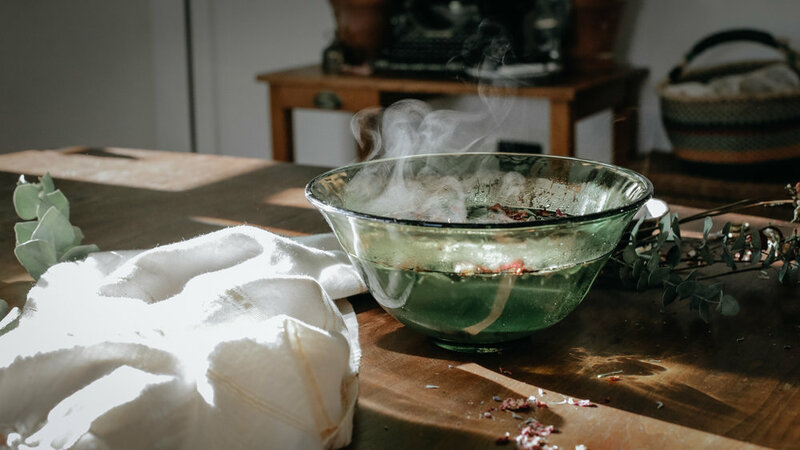 As we step quietly into the darker days of winter, I find myself deeply drawn to daily rituals. To simple acts like steeping and sweeping and setting the table. Making the bed. Stirring a pot of simmering soup. Perhaps it's the long dark nights, or the primal need to cozy in and hibernate. To turn inward. To retreat into our little burrows. Whatever it is, my homebody tendencies are off the charts right now. It's a little ironic that in this season of rest and retreat, it's so easy to get swept up in the cult of busy. To rush from place to place, laptop and presents and to-do lists in tow. To convince ourselves we don't have the time or space for slow living. I'm constantly reminding myself that all it takes is a little intention to transform daily chores into personal rituals. It doesn't need to be anything fancy. Quietly meditate while your tea steeps. Focus on clearing negativity as you sweep the kitchen floor. Light some candles on a weeknight. Start a gratitude journal. It can literally be anything. 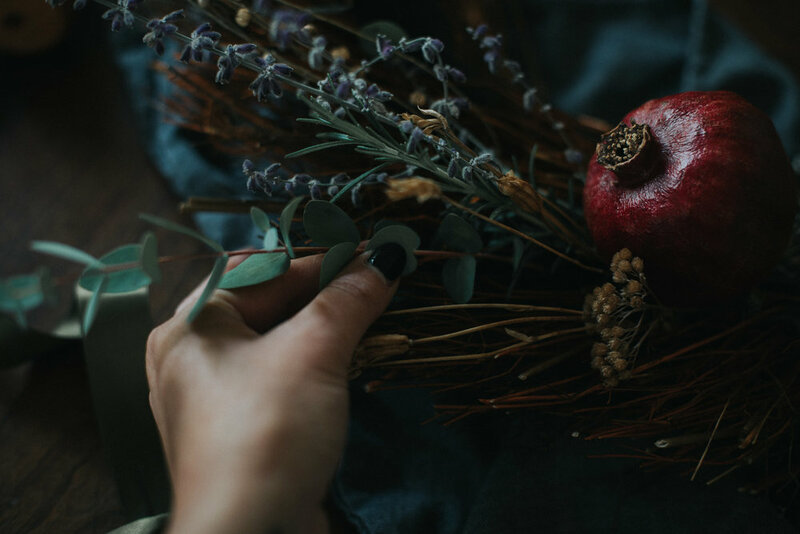 Whatever it looks like for you, finding ways to incorporate a little intention and ritual into daily habits can be a lovely way to stay nourished and grounded during the holiday bustle. One of my favorite personal rituals is setting the table. I love to weave in a little symbolism. To play with herbs. Light a few candles. Maybe break out the nice napkins. It's my way of creating sacred space for dear ones to gather. An altar to honor togetherness. This winter pomegranate and eucalyptus tablescape is admittedly much fancier than I would normally attempt on a weeknight, but hey, it's the holidays. 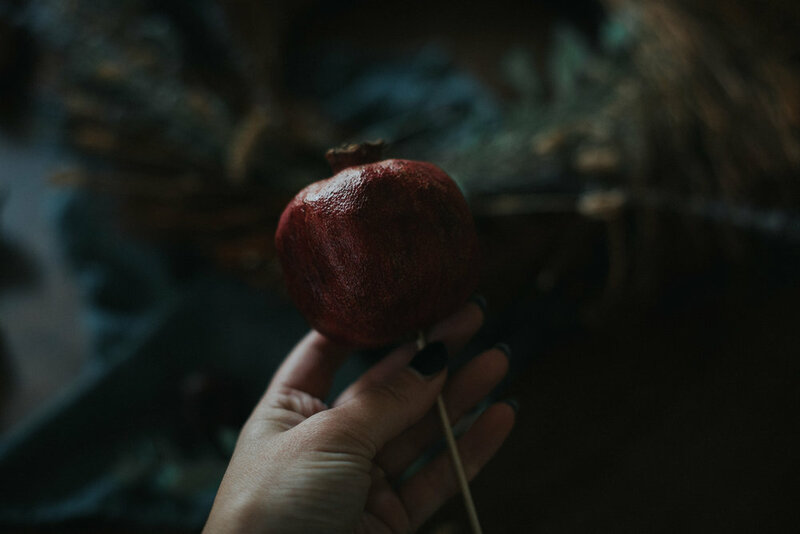 Pomegranates have long symbolized the decent of Persephone into the underworld and the seasonal transition into winter. They are associated with abundance and prosperity. Eucalyptus is believed to ward off arguments and clear any negative energy. Grey candles promote balance. Magnolia leaves for relaxation. A secret spell to bless our table. Sending you all love and light and lots of hygge today (and everyday.) I am so grateful for each and every one of you. When I think back on childhood holidays, my earliest memories are wrapped in the warm glow of white candles. I see baskets of apples and hot waffles with jam and garlands of happy gingerbread men in the window. My father teaching me to ski in our driveway. Making salt dough ornaments in a cozy mountain hytte with my mom and siblings. Long nights and endless snow. We left Norway when I was only seven, but the quiet simplicity of a Scandinavian Christmas planted deep seeds I still carry. The Norwegian concept of koselig, similar to the Danish hygge, is one that has no direct translation. It can be used as both a noun and a verb and essentially captures the cozy contentedness you feel when you warm chilly feet by the fire or gather with dear ones over a candlelit dinner at home. Koselig is simple and handmade and nurturing. It values the little things. The important things. Like fresh coffee and good friends and cozy slippers. In many ways, koselig is the original art of slow living. When it comes to the holidays, I love to make our home feel warm and welcoming and koselig. I tend to keep decorations simple and handmade. Foraged juniper boughs. Straw ornaments. Endless white candles....you get the idea. 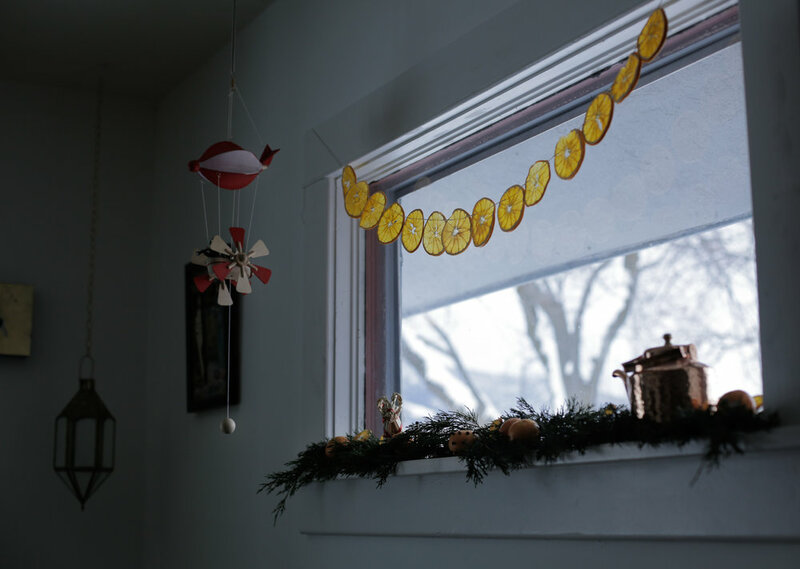 I always make a few batches of these dried orange garlands to hang in windows and gift to friends. The winter light shines through them like little stained glass windows and makes me smile. Little drops of sunshine to brighten the dark winter days. This year I also took a stab at making simple orange pomander balls to bring in the scents of winter. You guys - I don't know how I have never tried these before! First off, they smell incredible. Warm and spicy and Christmasy. And the super complicated DIY instructions? Stick some cloves in an orange. That's it. Done. They look lovely hanging on the tree or in a happy bowl on the kitchen table (where I may or may not have grabbed one as I rushed out the door for a last minute hostess gift.) Everybody wins. Some years it's all too easy to get lost in the hustle of the holidays. To get overwhelmed by the commercialization and travel itineraries and endless to-do lists. To lose sight of the quiet moments that make this season magical. I think we could all benefit from slowing down and cozying in and lighting a few more candles. It's the most koselig time of the year. Happy Holidays, lovelies. Hope your week is warm and fuzzy. 1. Cut the oranges into very thin slices (about 1/4" if you can). Some will be thicker than others. Just remember, the thinner the slices, the less time they will take to dry. 2. If you don't have a food dehydrator, I can't recommend them enough. It has quickly become my favorite kitchen tool. I purchased this one on Amazon a few years ago and we get a ton of use out of it for everything from kale chips and fruit leather, to dried herbs and sun-dried tomatoes. This thing pays for itself in time and deliciousness. Dehydrator: Place the orange slices on the drying racks of your dehydrator. Set the temperature to 135° F and leave to dry for 12 - 14 hours. Flip after about 8 hours. You'll know they are done when you press your fingernail into the slices and they crack or crunch a bit. Make sure they are fully dry and not sticky or soft. Oven: Preheat the oven to 170° F or as low temp as it will go. Place the oranges on a parchment lined baking sheet and place in the oven, leaving the door propped open a few inches. Bake for 3 hours, then flip oranges. Continue to bake until they fully dry out (usually about 8 hours.) I would recommend checking in every hour near the end until they reach the desired texture and lose their stickiness. Note: I haven't used the oven method in years since we purchased our dehydrator. You may need to add or decrease baking time depending on the size of your slices and your oven. It goes without saying, but always babysit the oven when it is on for extended periods like this. 3. Once the oranges are fully dry, use a wooden or metal dowel to poke one hole on the left and right side of the orange. Make sure they are parallel, as you will be threading the twine through them later. I like to place mine in the top third of the orange. 4. Weave your twine through the holes to string the orange slices together. I like to hide my stitch on the back side of the orange. 5. Hang in a window where the winter light can shine through. I also hang any extra slices on the tree or use them to spruce up my wrapping! 1. Push the sharp end of the cloves through the skin of the orange or mandarin. Create a simple design by studding the cloves around the orange. 2. Hang to dry with ribbon. As the orange dries out, it will fill the house with a spicy, wintery aroma. For thousands of years, the approach of winter was a dire, fearful time for humans. It meant famine and illness and death were on the horizon. That the world would be plunged into relentless cold and darkness and that not everyone would survive. It was a time to huddle together. To batten down the hatches. To hide away and hold on till spring. December (and the winter solstice specifically), marked the pinnacle of this desolate season. But many cultures also used this as a time to celebrate life and light in the face of the encroaching darkness. To gather with loved ones around the fire. To feast and sing and share what little we had squirreled away. To celebrate the simple fact that we were still alive. Now don't get me wrong, humans have plenty of flaws, but I think there is something deeply beautiful about that. That on the longest, coldest nights of the year, when all was quiet and frozen and bleak, we shined our flickering lights into the vast darkness and found joy. I love that you can still find remnants of these ancient rituals in our modern holiday traditions. Little echoes of forgotten customs. We still hang lights in dark windows. We feast and sing. We bring in evergreens that don't mind the cold. Perhaps one of the most ubiquitous of these symbols is the humble wreath. There are many theories on the origin of this tradition, but my personal favorite is that the hearty evergreens and circular shape represent eternal life in the face of winter. We hang them in our doors and windows to remind our neighbors, "It's alright, friends. Even on the darkest days of the year, something green remains." What a lovely thought. I made this simple wreath with bay laurel and eucalyptus and an old embroidery hoop. Nothing too fancy. Just simple supplies, a little time and a cup of peppermint tea. It felt good to slow down and breathe deep and play with plants for a while. A nice slow segue into the bustle of the holiday season. Happy December, dear ones. Here's to sharing and celebrating and shining our little lights. So much love to you. 1. Start by cutting your bay laurel branches into more manageable lengths. I cut mine into roughly 1 foot sections. The size of these will depend on the size of your embroidery hoop. I set aside a few small sprigs to fill in any sparse spots later. 2. Play with the natural curve of the branches to find where they want to lay on the hoop. Word to the wise: don't try to fight the natural curve of the branches. Let them lay how they want to lay and work around their natural shape. Bay laurel lends itself beautifully to a circular wreath. Using segments of floral wire, begin wrapping the branches in segments around the hoop. It's okay if the wire is visible or there are some bare spots. You can cover these will smaller greens later. Use small lengths of wire to attach each branch in 2 - 3 spots. 3. Once you have your base greenery secured around the hoop you can start playing with the smaller greens. I wove in blue and seeded eucalyptus to fill in bare spots and cover any exposed wire. I also added a few more sprigs of bay laurel here and there. Even some pheasant feathers would be cool. There is no right answer here! Have fun and play with finding the right balance. I tend to like things a little more organic and unfussy so I left mine a bit wild. You can easily tame it with some additional floral wire if thats more your style. It helps to hold the wreath up to the wall now and then to get perspective and make sure the weight is balanced. 4. Tie a pretty ribbon or twine around the top of the wreath. You can either use this to hang it, or if you have a wreath hanger you could opt for the traditional bow. As a finishing touch, I wove in a few dried pepper berries left over from our Thanksgiving table. Those little guys last forever. 5. Hang and enjoy! You can definitely hang these little loves outside, but I couldn't bare to be parted with the spicy, earthy aroma of the bay leaves. I opted to display ours in our front window so it can be seen from the street, but we can still smell it in the house. Everybody wins. There is one spot in our home we always seem to gravitate to. A warm little corner perfectly suited for morning coffees and late night cribbage and quiet moments alone. For simple evenings spent with good friends, sharing food and stories. Laughing. Being together. They say the kitchen is the heart of the home, but I have a sneaking suspicion it's actually the table. For years we all crammed around our tiny kitchen table, bumping elbows and balancing toddlers on laps. It was close and cozy, but often left someone standing at the counter or retreating to the couch in search of a seat. So my ever-talented husband built this gorgeous blue spruce coffee / dining / everything table, which has quickly become the centerpiece of our household. He made this in like an afternoon, you guys. He's like a little wood gnome, that one. And I am totally smitten with the result. There is something so grounding about sitting on the floor. Down-to-earth in the most literal sense. And lord knows I love to set a pretty table. Setting a table can feel like something of a lost art these days. A relic of a bygone era of stuffy place cards and pickle forks. But I think there's something deeply satisfying about creating a lovely space for dear ones to gather. To set the vibe. To make things a little special. So this Thanksgiving, I wanted to create a table that felt simple and balanced and seasonal. Pretty and inviting and unfussy. I started by foraging through the garden and chilly neighborhood alleys for the heartiest herbs. The ones that have managed to survive early morning frosts and howling November winds. I returned with pink ears and cheeks and a fragrant bouquet of rosemary, sage, thyme, and eucalyptus. I supplemented with aromatic pepper berries and magnolia leaves from Habitat, my favorite little neighborhood flower shop, and mixed them in with this simple candle train I found for pennies at the flea market. The whole display cost less than a bag of coffee and smelled amazing. I also whipped up this classic pumpkin pie with frost kissed cranberries (because c'mon, what's Thanksgiving without pumpkin pie?) I thought about writing a whole DIY on the sugared cranberries, but they are so embarrassingly easy it seemed like overkill. Simply dissolve 1 cup sugar with 2 cups water on the stovetop. Pour the mixture over a bowl of cranberries and refrigerate overnight. In the morning, drain the cranberries and lay them out on parchment paper. Roll them in fresh sugar and let dry for 2 hours. They taste delicious and look sparkly and festive on the table. Easy. Peasy. Hope you all have a lovely, restful holiday weekend filled with love and food and gratitude. I am thankful for each and every one of you. Happy Thanksgiving, dear ones! These past few weeks threw us off our tracks a little. Sent us down some some unexpected roads and left us wondering how we got there. Questioning our place in it all. Yearning for a quiet moment away. It's so easy to lose yourself in the relentless hustle and digital hum of our current society. To lose touch with the quiet little moments that breathe joy into our daily lives. That give us peace. That resonate at a deeper level. So we ran away to the mountains. To recharge and reconnect and reprioritize. It's amazing what a wood burning stove and a clear starry sky can do for morale. We sang and laughed and played cribbage. We read entries in the lookout record and watched the sunset fade slowly into the Milky Way. We tromped happily among the rocks and told ghost stories and drank endless french presses of good strong coffee. In short, we totally blissed out. Places like these are special. Important. This particular lookout has been standing since the 1930's and is available to the public year round. Each traveler chops wood for the next guest and leaves the place a little nicer than they found it. It is a beautiful exercise in community preservation. Nearly everyone who stays does their part to make sure it continues. As we drove happily down the frosty mountain, hearts full and minds quiet, we vowed to find more time and space for places like this. To seek them out when we feel lost, like little lighthouses in the dark. To remember we are mountain kids, born and bred, and that every now and then we just need to go home. Yesterday marked the New Moon in Scorpio. The Witch's New Year. A time to honor our ancestors and make offerings and lift the thinning veil between worlds. A time to meditate on the natural cycles of life and death as we step from the final glowing days of fall into the long night of winter. 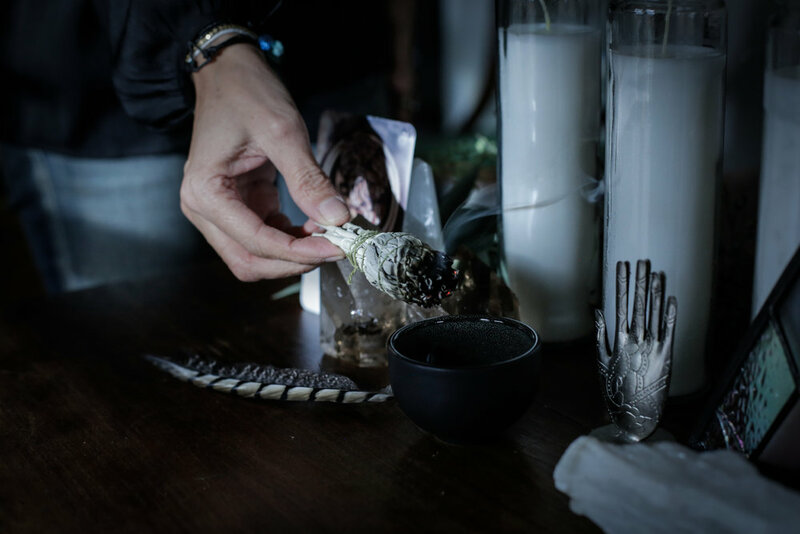 A time to get a little witchy and burn herbs and gather with our chosen ones. 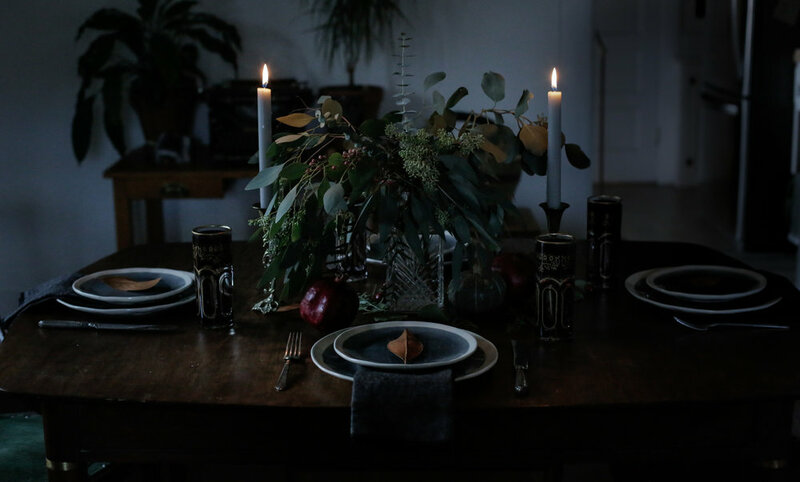 To celebrate the darkness of the New Moon and the coming season, my creative partner and co-conspirator, Lindy McKay, and I hosted little gathering. We mixed herbs and sipped tea and read tarot. We spoke of the stars and our pasts and our presents and our futures. We swirled tea leaves and watched the black candles burn low. It was a magical space and time to connect with some of the women in my life I rarely see. I think we, as a society, are really starved for these moments of communion and ritual. There are few things I love more than setting a beautiful space for people to gather. To slow down. To connect. All Hallows High Tea was the first in a series of seasonal pop-up events Lindy and I will be manifesting in the coming months to do just that. This new project is called The Secret Gathering. If you are interested in attending future gatherings, be sure to subscribe below. I'll make sure to let you know when the next event is brewing. Have a lovely All Hallows Eve my witchy ones! Sleeping in a haunted Victorian mansion seems like a lovely idea until it's time to go to actually go to sleep. Then you lie awake all night listening to the hiss of the radiator and the tapping of soft footsteps in the ballroom above. This was the sitting room attached to our suite. Everything left just as it was a century ago. Protected from the garish light of day by heavy velvet drapes and moth-eaten tapestries. What a strange and creepy and alluring portal to another time. I like to imagine who else has walked (or walks) these creaky oak floors in the quiet early hours. And now we walk quietly into the darker days. Into the days of mist and fog and dark forests and flickering candles. Of shuttered windows and crackling fires and root cellars and ghost stories. Fall is here, dear ones. I have always loved the sense of dark mystery that this season carries. The old magic. From a time when preparing for winter meant lots of foraging and preserving and ritual and superstition. This season never ceases to turn my attention to other realms. To other times. They say the veil between worlds is thinner this time of year. What a lovely thought. This past weekend, Rooster and I took a drive through the winding mountain road that leads to Garnet Ghost Town. The underbrush that surrounds the abandoned gold mine was already donning it's fiery fall colors as we walked quietly down the trail leading to the village. Places like these, frozen in time, demand a certain silence. A reverence. Almost like a cemetery. The artifacts you come across feel so personal. A child's shoe. A handwritten ledger. A torn petticoat. Left in a perfect state of arrested decay. Like their owner just stepped into the hall to fetch a needle and thread. Places like these make my heart go pitter-patter. I tiptoed quietly through the dust of the Grand Hotel, channeling my inner Nancy Drew. I couldn't shake the feeling of being watched. But it wasn't an unnerving presence...more like a maternal inn-keeper making sure I wasn't going to make a mess she would have to clean up. You could almost hear the rustle of heavy skirts coming down the attic stairs. I spent a few happy hours in this forgotten place. Watching the light shift on the peeling wall paper and imagining the souls that lived here.